Thanks for your interest in DCPS. If you’d like to learn more about joining our district or have questions about your application, please contact us using this email form to the right. We appreciate your email, and work to respond promptly to all inquiries. At DCPS, your impact starts in your classroom – but doesn't end there. Together, our team of passionate educators is defying expectations about what DC's students can achieve and changing the path of public education. JOIN THE NATION'S BEST TEACHERS – AND BECOME EVEN BETTER. We're looking for dynamic teachers who insist on excellence and are passionate about honing their craft. At DCPS, you'll get the feedback you need to do your best work, colleagues who share your high standards, and opportunities to lead without leaving the classroom. WE PAY OUR TEACHERS LIKE PROFESSIONALS AND CELEBRATE THEM LIKE ROCKSTARS. Top teachers can earn up to $100,000 in salary and bonuses by their fourth year and win awards of up to $10,000 for classroom excellence. Every year, we recognize the very best with an annual Standing Ovation gala. WE'RE MAKING HISTORY. We’re setting an ambitious standard for great teaching and making it a reality across the district. With your help, we’ll transform education for our 49,000 students and become the first urban district to close the gap between students from low-income backgrounds and their more affluent peers. JOIN US. We accept applications in all subjects and grade levels. We are particularly interested in candidates with a track record of success in the classroom. Watch our video about teaching in DCPS, view our deadlines and start your application today. To speak directly to one of our recruiters, reach out to us at teach.dcps@dc.gov. Stay connected with the DCPS recruitment team! Watch our webinar today. "I think I would have been lost without my instructional coach. The first day she came up to me and said, 'Hi. I know you are a first-year teacher and I just wanted to let you know that I am here to support you.'" A GROUNDBREAKING TEACHER EVALUATION SYSTEM (IMPACT). At DCPS, you'll finally have real conversations about teaching that help you get better every day. IMPACT sets a high bar for great instruction, gives all teachers a clear understanding of how they can grow, and provides useful feedback that helps them do their best work. Watch the video on IMPACT. INNOVATIVE PROFESSIONAL DEVELOPMENT.We’ve made an unprecedented investment in our teachers. In the 2016-2017 school year we launched a new professional learning program called LEAP (LEearning together to Advance our Practice). At its core, LEAP is about helping teachers become truly expert at teaching the DCPS Common Core-aligned curriculum so that every student across the city experiences rich, engaging, and challenging instruction every day. To do this, teachers engage in a weekly cycle of development in small content-specific professional learning communities (LEAP Teams) at their schools. These teams are led by content experts (LEAP Leaders) at their schools. The Essential Practices are DCPS’ definition of effective instruction and outline the key actions we believe lead to increased student achievement. The Essential Practices provide a common language for effective instruction, which enables us to align IMPACT and professional support. They also provide clear expectations for teachers and illustrate what success looks like in DCPS classrooms. Check out the Essential Practices and see examples from the Essential Practices Video Library, a growing collection of videos featuring DCPS teachers from all over the district. AN UNPRECEDENTED TEACHER CAREER LADDER. Through the Leadership Initiative For Teachers (LIFT), great teachers can extend their reach – for example, leading subject area meet-up groups and shaping district decisions – without leaving the classroom. Watch the video on LIFT. "Teachers have the opportunity to make more than $130,000 a year. It's not that money should drive this work, but it most certainly makes me feel respected as an educator that somebody recognizes the work I do is just as important as a lawyer or doctor." At DCPS, you don't have to choose between doing what you love and making a great living. We believe teachers are highly skilled professionals and should be compensated accordingly. Our progressive salary scale is the first in the nation to reward excellence in a real way. Top teachers can earn up to $100,000 in salary and bonuses by their fourth year and win awards of up to $10,000 for classroom excellence. Simply put, great teachers can earn more in DCPS than in any other district. "What happens in DC Public Schools has national implications." No traditional public school district in the nation has closed the achievement gap between students from low-income backgrounds and their more affluent peers. Individual schools have done it. Some charter school networks have done it. But DCPS is going to be the first large urban school system to do it. Today, we're at the cutting edge of education reform, doing the work that most districts are just talking about. It all starts with a simple idea: make great teaching the priority. We can't control whether students come to school hungry or what other challenges they face outside of school. But for eight hours each day we can give every student the chance to learn from an excellent teacher – and defy expectations about what our students are able to achieve. Every student can excel academically. We're on a mission to show that traditional public school districts – where 95 percent of our nation's students are educated – can succeed at the very highest levels. You can help make it happen. DCPS is one of the fastest improving urban school districts in America. In fact, over the past decade, we've nearly doubled the number of students who are proficient in reading and math. As a result of our progress, more and more families are choosing DCPS for their children. We’re making an unprecedented investment in our teachers. To help ensure that every child experiences outstanding instruction every single day in our district, we have launched a new professional learning program called LEAP (LEearning together to Advance our Practice). We are helping teachers hone their crafts. At its core, LEAP is about creating content-specific professional learning communities (LEAP Teams) in our schools. Through LEAP, teachers will learn about and apply the latest Common Core instructional practices with their peers. They’ll also get weekly observations and feedback from content experts. In short, we’re aiming to make DCPS the best place in America to become an expert teacher. Take the LEAP and join DCPS! If you love helping support teachers, come join us as a LEAP Team Leader. LEAP Teams will be led by educators who are experts in a particular content area. The team leaders can be a Teacher Leader (a teacher who teaches part-time and coaches part-time), an Instructional Coach (who coaches full-time), or an Assistant Principal (who coaches 75% of the time and supports other school-wide initiatives 25% of the time). You can become a Teacher Leader through the Teacher Leadership Innovation (TLI) program, which offers excellent teachers the opportunity to teach for at least 50% of the day and spend the remainder of their day coaching and leading their peers. TLI Teacher Leaders will receive high-quality professional development and a $2,500 stipend upon successful completion of the TLI program requirements. To learn more about this exciting initiative, click here. How to Apply If you’re interested in applying to the TLI Teacher Leader position, please click here for job description and application steps. When prompted for experience, select the TLI Teacher Leader position from the dropdown menu and proceed to complete the Teacher application. Upon successful completion of this application, you will be asked to complete a content assessment for your primary subject area. The LEAP Teacher Leader and Assistant Principal applications for the 2017-2018 school year open January 5, 2017. Please note that you must first complete the general teacher application to be considered for the position. Click here to apply for Instructional Coach positions. EMPOWERING MALES OF COLOR in DCPS is an aligned effort by the District of Columbia Public Schools to identify and assess current challenges and successes of PK – 12 Black and Latino males. We will collaborate with the community, as well as school & district leaders to implement effective strategies to enhance the student experience, increase achievement, and prepare our males of color for college, careers, and life beyond DCPS. Prepare students for high-wage, high-growth careers. ENGAGE our students, families, and the community in solutions that ensure the long-term success of our males of color. MENTORS: Partner with Community-Based Organizations to provide literacy support and mentorship to males of color. Launch a Student Task Force to ensure that the student voice is informing our work. IMPROVE and expand research-based strategies that are already underway within the district – with an emphasis on equity. INNOVATE and challenge our approach to problems and reflect on policies that have consistently made an impact on the academic achievement and development of our males of color. To find out more about the Empowering Males of Color initiative, please visit http://dcps.dc.gov/emoc. Teach in DC, and go global. DCPS is delighted to partner with the Peace Corps to introduce the DC Global Language Fellowship (DC GLC). This program connects Returned Peace Corps Volunteers (RPCVs) with demonstrated multi-lingual proficiency and global experience to DCPS World Language classrooms. RPCVs selected for the GLC are given an opportunity to continue to apply their developing teaching practice in a US context, and find a professional home in a District that places a high value on global competence. To learn more about the DC GLC and eligibility requirements for participation, please click here. To apply to the DC GLC, please click here. DCPS has invested in world language programming in all schools, from early childhood level through advanced high school courses. DCPS world language instruction is aligned with national American Council on the Teaching of Foreign Languages (ACTFL) World Readiness Standards, which seek to link culture and communication through language learning. DCPS has also partnered with ACTFL to provide students with a world-class curriculum that includes all modes of language learning: interpersonal, interpretive, and presentational. Schools offer at least one of the following seven world languages: American Sign Language, Arabic, Chinese, French, Italian, Latin, and Spanish. Every student deserves a world of possibilities; that’s why DCPS developed a study abroad program. DCPS Study Abroad helps ensure that our global citizens have access to global experiences, so that travel becomes the expectation rather than the exception for our students. All 8th grade, 11th grade and Certificate 3 (C3) DCPS students who are studying a World Language are eligible for short-term study abroad programs on language immersion, global leadership, or service learning. The Embassy Adoption Program exposes students to international perspectives and cross-cultural lessons. Through direct interactions with embassies and other global entities, fifth and sixth grade students attending DC Public Schools have the opportunity to learn about the language, customs, and history of their partner’s home country and culture. To date, more than 50,000 youth have partnered with over 100 embassies representing countries from around the world. The program has received various accolades, including the US Department of Education Award for Outstanding International Education Program. To find out more about global education within DC Public Schools, please visit https://dcpsglobaled.org/. If you are interested in starting a teacher application, please find it here. If you are interested in starting a principal application, please find it here. If you are interested in starting an educational aide application, please find it here. All other school-based applications can be found here. School security guard applications can be found here. Bus driver and attendant positions can be found through the Office of the State Superintendent of Education here. INTERESTED IN STUDENT TEACHING IN ONE OF OUR SCHOOLS? Student teachers must first find and confirm with a principal and teacher willing to host them. Then, complete the fingerprinting process at our Central Office (1200 First Street, NE). Learn more about fingerprinting here. INTERESTED IN LEARNING MORE ABOUT DCPS AND THE TEACHER APPLICATION PROCESS FROM THE RECRUITMENT TEAM? Watch our pre-recorded webinar here. INTERESTED IN OTHER SCHOOL-BASED POSITIONS? School-based, non-instructional positions (e.g., registrar, administrative aide, etc.) are handled on a school-by-school basis, and we do not have a centralized application for these positions. You would need to contact individual schools to inquire about openings in these areas. Please refer to our "School Profiles" page with more information and contact information on all of our schools. You can access that page here. Find additional information about fingerprinting and drug testing here. Find all licensure related questions here. Find answers to all fingerprinting questions here. Still want to know more about our Leadership Initiative for Teachers (LIFT)? Listen to our LIFT webinar here. Learn more about IMPACT here. WHAT DOES IT MEAN TO BE A NOVICE TEACHER CANDIDATE? Teachers with 0 or 1 year full-time experience will complete the track for novice teachers. Full-time teaching experience does not include student-teaching, collegiate-level teaching, apprenticeships, substitute-teaching, or time spent in other training programs. Counting these experiences as "full-time teaching experiences" may cause a delay or disqualification of your application. WHAT DOES IT MEAN TO BE AN EXPERIENCED TEACHER CANDIDATE? Teachers with two or more years of full-time teaching experience are considered experienced teachers and will complete the application track for experienced teachers. HOW CAN I UPLOAD ADDITIONAL DOCUMENTS TO MY APPLICATION? To upload additional documents to your application, you will need to visit our website at dcps.force.com. Login with your email and password and upload these documents there; feel free to upload your documents where it asks for your resume, as these attachments all go to the same place. WHAT IS THE FINGERPRINTING PROCESS? At this time, it is a DC law that all candidates must be fingerprinted at our DCPS Fingerprinting Office, and we cannot accept fingerprinting clearances from other entities. Although we understand that this is difficult for out-of-state candidates, we encourage all candidates to come to our central offices as soon as possible to complete this process, as you will not be able to accept a position with DC Public Schools until your fingerprints have been cleared. Before coming to our office, complete the fingerprinting application online here. DO I NEED AN APPOINTMENT TO GET FINGERPRINTED? No. For fingerprinting, you will be seen on a first-come basis. WHERE IS THE FINGERPRINTING OFFICE? Fingerprints are completed, free of charge, at the DCPS Central Office. Please visit 1200 First Street, NE; 10th Floor to complete this process. WHAT ARE THE HOURS OF FINGERPRINTING? WHAT IS THE DRUG TESTING PROCESS? All teacher candidates are required to complete the mandatory pre-employment drug test within 15 days of receipt of notice of testing requirement, and your clearance is valid for one year. Once you are selected for hire, you will receive an email from the District of Columbia (donotreply@mroresultsonline.com) instructing you on how to schedule and complete your drug screening test. Your drug testing results are communicated from the medical facility to DCPS, typically within five (5) business days following the test date. Your employment file will be updated accordingly—it is not necessary for you to collect your drug testing results to provide to DCPS. Once we have evidence that you have cleared the background check and the drug test, you will receive notification regarding your status in the onboarding process. For more information about drug testing, please visit the DCPS Mandatory Alcohol and Drug Testing website or contact the DCPS MDAT team at dcps.mdat@dc.gov. You're on your way to becoming part of the fastest improving urban school district in the country! 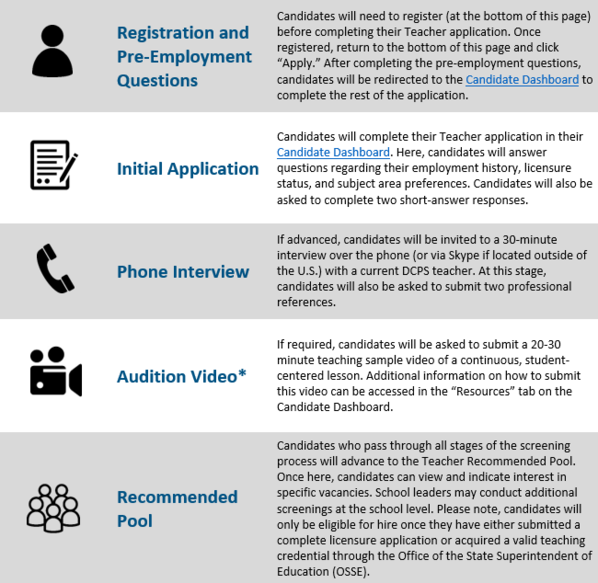 If you have already started an application for the 2018-19 or 2019-20 school year, click here to return to the Candidate Dashboard. If you applied for the 2018-19 school year and would like to submit an application for the 2019-20 school year, please see instructions for how to do so here. Please note that all candidates must reapply for the upcoming school year. Current DCPS teachers looking to transfer will be able to apply through the Transfer application starting January 21, 2019. Please note that current DCPS teachers will not be required to complete evaluative components (essay, interview, audition video) of the application. To apply as a transfer, please register and complete the pre-employment questions as normal. Be sure to use your dc.gov email address. Click here for the internal transfer guide. * Following the completion of a phone interview, some candidates may be asked to upload a teaching sample. This is to ensure that our team has enough information to make strong and accurate hiring decisions. For additional information on the Audition Video portion of the selection process, refer to our Audition Video Guide. If you are experiencing technical difficulties, please contact the DCPS Teacher Recruitment and Selection team by email at teach.dcps@dc.gov. I’m so excited to be part of the bigger movement that’s happening in DCPS, because that’s what’s best for kids. What brought you to DCPS? I loved teaching in New York City, but no one really ever told me how to become a better teacher. I felt like my impact was within my classroom and my grade. I was looking for more – to broaden my impact without leaving the classroom. How does DCPS give teachers a voice? I believe DC’s new structure with the LIFT ladder and the Chancellor’s Teachers’ Cabinet gives teachers a voice. I could still be in the classroom but my voice could be heard on bigger issues, like teacher evaluation and closing the achievement gap. Teachers feel valued because their voices are heard. I actually feel like people are listening to me. What excites you about teaching in DCPS? I love teaching, I love my classroom, and I’m so excited to be part of the bigger movement that’s happening in DCPS, because that’s what’s best for kids. I wanted to have my name go down in history as part of DC’s push for reform. After teaching for 12 years in Maryland, I thought, "You know, I need a change." I was looking for a new challenge. I saw something on the news that talked about this push for reform in DC. They said your zip code should not matter in terms of whether you get a quality education. And I said to myself, "Wow. Wouldn't it be great to be a part of this initiative?" I wanted to have my name go down in history as part of that. What is it like to teach here? When I got here, the principal, the teachers, and the parents were all so inviting. Many teachers have an open door policy. I can go in and get advice and strategies to actually use in my classroom. Their support was especially helpful for my work with younger kids, since I had only taught in high schools before coming to DCPS. How does DCPS support your growth? I appreciate that DCPS constantly pushes us to get better as teachers. I'm not content to just tread water. I want to continue to absorb more information because that makes me a better teacher. I definitely think that the tools are here for us. We are trying as hard as we can to become the best school district in the country, and there’s evidence of that in every single school. What was DCPS like when you started teaching here? When I joined DCPS 11 years ago, it didn't seem like much was happening to increase student achievement. Priorities were different from school to school and from teacher to teacher. So many teachers really wanted to do well by their students, but there was never a lot of time put into defining what good teaching looks like. How has DCPS changed in the past few years? There's been a lot of emphasis placed on what exactly it means to teach a concept effectively: how do you know a student has grasped that skill, what are your questions to push them to delve deeper? DCPS is pushing the importance of strong curriculum, but allows us more freedom in what tools we use. That’s what I’ve always wanted. DCPS’s direction is promising because it's showing students that, as a district—teachers, principals, and administrators—we are really dedicated to working towards their achievement. The message we’re sending is, “DCPS is trying as hard as we can to become the best school district in the country,” and there's evidence of that in every single school.